You’ll need a medium-sized jar with a lid for this one! Tricky tip... you can add all of your ingredients to the jar and keep it in the fridge the night before! Tote to work and cook in the microwave for a super-speedy midweek brekkie solution. 1/4 teaspoon sea salt and freshly ground black pepper. 1. Crack eggs straight into the jar. Add in the milk, cheese, onion, ham, dill, salt and pepper. 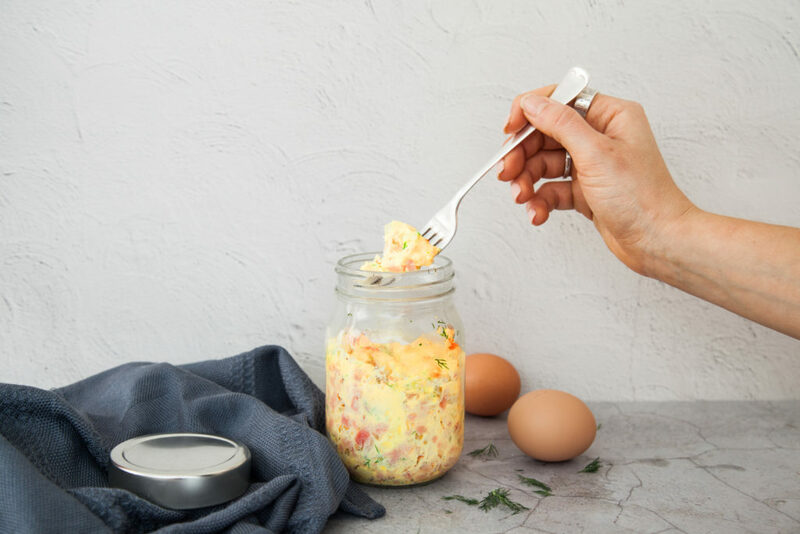 Place the lid on the jar and shake until eggs are scrambled and ingredients are well-combined. If you don’t have a jar, place all ingredients in a mug and whisk with a fork to combine. 2. Remove the jar lid if using and place in the microwave. Microwave on high for 2–2 ½ minutes, checking every 30 seconds to make sure it is not overflowing. You may have have to cook for a little more or less depending on the strength of your microwave.